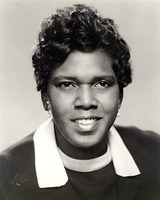 Barbara Charline Jordan (February 21, 1936 – January 17, 1996) was an American politician and a leader of the Civil Rights movement. A Democrat, she was the first African American elected to the Texas Senate after Reconstruction, the first southernblack female elected to the United States House of Representatives, and the first African-American woman to deliver the keynote address at a Democratic National Convention. She received the Presidential Medal of Freedom, among numerous other honors. She was a member of the Peabody Awards Board of Jurors from 1978 to 1980. On her death, she became the first African-American woman to be buried in the Texas State Cemetery.